ArktosArt.com is the online version of our local art gallery,’ Arktos’ in Thessaloniki, Greece. 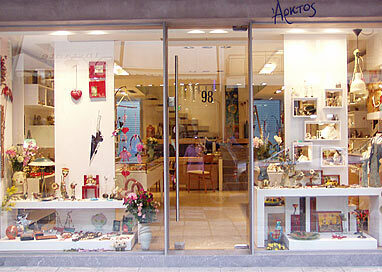 Our local shop, Arktos’, is situated in Passalidi 98, Kalamaria, Thessaloniki. ArktosArt.com has been on line for a number of years, but only on the breaking of 2014 has it started to be a real online shop. 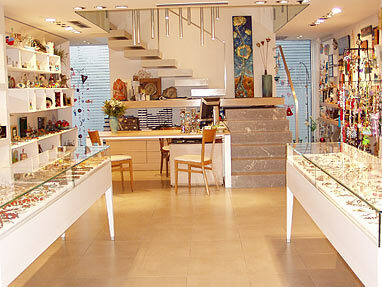 It is full of gorgeous Greek artworks and unique jewellery. It is an eclectic mix of fun and functional objects, of art and everyday use items combined or side by side. ArktosArt.com specializes in fine arts, applied arts, folk art, Greek ceramics and pottery, various crafted items, fine jewellery, costume jewellery, fashionable and fun finds, men’s and women’s accessories, home décor, children’s toys and gifts, etc. The people behind it are Andreas and Sophia, a married couple , co-workers and collaborators since the early eighties. Andreas has worked in ceramics and pottery, but now creates an impressive line of jewelry, worry beads, clocks and various artworks for our gallery, other than his own line of functional pottery and sculptural ceramics. Sophia came from a teaching background, with a unquenchable love of the arts and started meddling with ceramics at the same time with Andreas and a little later with jewellery. Between us, we make a large line of artful items or functional ware, jewels and accessories. The line between art and function not always visible. At our local shop and on line shop, we host the works of a tremendous array of Greek artists. ArktosArt.com is home to the best modern Greek pottery and ceramics, Greek small sculptures and paintings, Greek designer jewellery, Greek folk crafts, Greek glass, boats and ships, worry beads, key rings and cufflinks, clocks and hangers, collectible miniatures, charms and good luck items, toys and childern’s gifts, a vast collection of décor and gift items. You name the occasion, we’ve got the gift for it. ArktosArt.com loves to undertake custom orders, corporate gifts, favours and anything else, where handmade artwork would be in order, just contact us with your requests and ideas.